Classy build, sleek style, and top-notch sound quality are some crucial features that your studio quality Bluetooth speaker needs to have. Every budding musician and music enthusiasts will understand just how daunting and intimidating it is to choose the right speaker. With a market that is bursting with new launches every day, you need a speaker that can fulfill all your needs and requirements. To make the choosing process easier for you, we have decided to review and compare two of the most popular and trending speakers’ right now- Harman Kardon Onyx Studio 3 and Harman Kardon Onyx Studio 4. We have thoroughly investigated and compared both the products to determine the best one. Both Harmon Kardon Onyx Studio 3 and 4 are extremely similar in their build and design. Without any fussy colors and blinding designs, the speakers are sleek, classy, and modern. If you are searching for a good-looking speaker, then there is no doubt that you will absolutely love them both. With a soft-matte black front and a black leather back, the speakers have one of the most luxurious and elegant exteriors ever. While the speakers are not exactly small and convenient to be carried in your pockets or such, they are of an average size. You can easily carry them around in your bag. 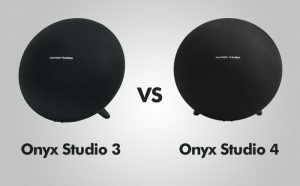 When it comes to the weight of both the speakers, Harman Kardon Onyx Studio 4 is definitely lighter than Onyx Studio 3. Onyx Studio 4 weighs 7.2 pounds while Onyx Studio 3 weighs 7.17 pounds. The difference is not much but it can be a deciding factor for some people. The build quality and material feel durable and strong. It is definitely long-lasting and will continue to do its job even with some rough handling. When we compared the build design and quality of both the speakers, it was a tie as both of them are almost identical. Portability is an issue in both the speakers. With a dimension of 15 * 10 * 15 inches and a weight of 7.17 pounds, Onyx Studio 3 is by no means small or light. If you are looking for a speaker that is small, portable, and suitable for every occasion, then this is definitely not for you. It is essentially a big, bulky flying saucer that is much heavier than an average speaker in the market. An added handle on the rear and the circular design saves the speaker’s portability to some extent as you can carry them around, albeit not as easily. You will need a decent sized bag if you want to take the speaker outside with you. Onyx studio 4 is a bit smaller and lighter than its predecessor. With a dimension of 13* 12* 8.5 inches and a weight of 7.2 pounds, it definitely is more portable when compared to Onyx Studio 3. Onyx Studio 3 only offers up to 5 hours of playtime which is quite low when compared to some other speakers in the market. When it comes to the battery life of the Onyx Studio 4, it stays true to its claim and easily lasts 8 hours which is decent enough. If you are looking for a speaker that can provide you with sweet and soothing harmonies, Onyx Studio 3 is perfect for you. With 2 tweeters and 2 large woofers, the speaker avails a bass that is well-rounded, deep, and intricate. If you are a bass-enthusiast, you will absolutely love the Onyx Studio 3’s sound quality. Even though the bass is deep and warm, the mids and the highs are neither overpowered not do they lose their vibrancy. The speaker offers beautiful and bright vocals that will leave you impressed. We loved the fact that the speaker is able to maintain the same sound quality even at maximum volume. We did not see any distortions. Onyx Studio 4 also offers top-notch sound quality that is enjoyable, accurate, and clear. It offers a great dynamic range which makes the sound more deep, warm, and entertaining. The treble is crisp; the highs and the mids wonderfully balanced. The one problem we have with this speaker it the fact that the bass is not quite that deep. Yes, the bass is resonant and decent enough, but the bass heads and low range enthusiasts will definitely find it lacking. But it does make the overall relation between all the ranges more resonant and resounding. If you want a more bass-targeted speaker, go for Onyx Studio 3. But if you are looking for more of an all-rounder, Onyx Studio 4 is best for you. PROS: Sleek and modern design / Durable & strong / Powerful bass / Great mids and highs / Soothing and harmonic sound. PROS: Great play time / Accurate and clear sound / Great mids and highs / Enjoyable and crisp / Durable & stylish. CONS: Bulky and heavy / Average battery life / May disconnect automatically. CONS: Heavy and bulky / Bass is not as powerful / Confusing controls. If you are looking for a great Bluetooth speaker in the market, both Harman Kardon Onyx Studio 3 and 4 are great choices. But if you want a more light and portable one, then these are not for you. Both the speakers are stylish and classy to look at. The build is durable and the sound quality is great. If you are looking for a speaker that is more bass-centric, Onyx Studio 3 will leave you immensely impressed. While on the other hand, if you want a speaker that is more neutral and showcase all the ranges equally well, you will like Onyx Studio 4 more. Yes, both the speakers have their cons but their attractive price points and great sound quality definitely makes up for it. If you are struggling to choose the right one, we hope our in-depth review and comparison helped you make the right decision.